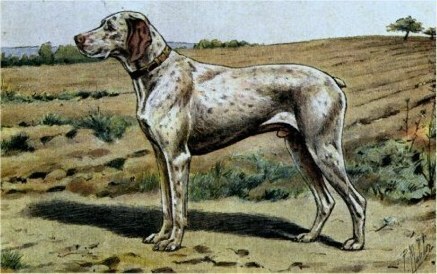 The Braque du Bourbonnais (brock-do-bor-bon-NAY) is one of the most ancient French pointers originally out of Bourbon, a region of central France. The breed was already known in 1598 as a dog skillful at hunting quail. Authors described the breed as a pleasant companion of the hunter, of rustic and healthy appearance, born with a short tail, showing a white coat with widespread pale brown or fawn fine ticking. The breeders wanted to impose an original coat of “faded lilac” and also of being born with a naturally short tail. The dogs that differed cosmetically with tails or spots were not bred. With such strict selections on a breed with a reduced gene pool, they became nearly extinct. Between 1963 and 1973 there were no registrations with L.O.F. With the dog being bred on appearance alone, the hunting instincts were sacrificed. In 1970, under the influence and direction of Michel Comte, a team of breeders took on the task of helping the survival of the Bourbonnais Pointing Dog. With the acceptance of spots and docked tails, the hunting instincts were brought back. The first Bourbonnais was imported into the US in the late 1980's. 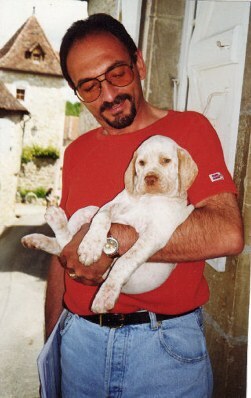 Marc Sudret (Pech de Cayrol) was the breeder under Francoise Sarret's (Croix Saint Loup) kennel name. The archives and the literature available, we suggest that the idea of creating a club race on our dog, dates from 1919. 1925 is also the year of filing of the first breed standard in the near Société Centrale Canine. The first president was M. de Lachomette active. He was elected to the presidency of the Société Centrale Canine in 1938 on that date, the Secretary General, Mr. Bush, assumed, therefore, the newspaper club. World War II interrupted the activities Dog of France. Many breeds in French regional suffered the consequences, often negative, for their livestock. In 1947, the club resumed its activities. Mr. President Tourret was always supported by Mr. Bush, Secretary General, ensuring a logical transition. Followed a period of sleep in the club. The fad for some races with the consent of the hunters, has endangered many of our wonderful breeds of soils. In the 1970s, a group of enthusiasts on a mission revival of Braque du Bourbonnais. In 1985, after a formal internship, the Canine Central Company has once again entrusted the management of the Club's race Braque du Bourbonnais. Michel Comte assumed the presidency of the period until July 2001, when Alain Picot was elected to the presidency. In 2002 a new constitution and bylaws were approved. DEFEND THE INTERESTS OF THE FRENCH POINTING DOG. This breed is "Complete" as a hunting and family companion. They possess exceptional noses, unbelievable desire and drive. 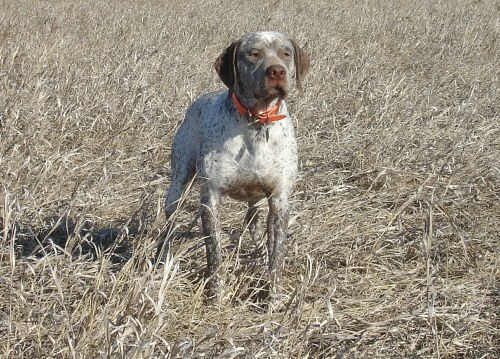 These versatile gun dogs have a deliberate search in the field. The Braque du Bourbonnais' are calm, affectionate family companions. They are wrapped up in a medium sized package that is easily maintained with their short, minimal shedding, "Wash-and-wear" coats. We, at Rufnit Kennels, are striving to keep this breed thriving. NAVHDA is the foundation registry and testing organization for the Braque du Bourbonnais in North America. Our dogs are tested through NAVHDA, which has an excellent approach to training hunting dogs. Nothing is more important to us than the welfare and perpetuation of these remarkable companions. Rufnit Kennels continues to make history by being the sole recipient of the prestigious "Natural Ability Breeder Awards" presented by NAVHDA for the Braque du Bourbonnais. These awards confirm that Rufnit Kennels is keeping on track with their breeding program. By NAVHDA using a "standard" for testing purposes, Rufnit Kennels can compare our Braque du Bourbonnais with other versatile breeds. We are producing Braque du Bourbonnais' with fantastic hunting instincts and abilities. Rufnit Kennels has produced the youngest Braque du Bourbonnais to receive "Prizes" in Natural Ability through NAVHDA at five months of age (proving true Natural Ability), the Utility Preparatory Test at eleven months of age and the Utility Test at nineteen months of age. As for North American bred Braque du Bourbonnais', Rufnit Kennels' progenies notably dominate the NAVHDA Prize I NA's (~80%), with numerous progeny holding NA Prize II and NA Prize III positions! Rufnit Kennels' thrives on producing superior companions. To ensure the quality of our companions we take it a step higher than ever before, to DNA Certify our Sire's and Dam's. Rufnit Kennels' is worthy of their place in the Braque du Bourbonnais' "history-in-the-making." and in turn producing sound, quality bird dogs. Michael Comte continues to keep data regarding all aspects of the Braque du Bourbonnais. The following chart shows the number of Braque du Bourbonnais' registered by area per year. By the way Shari, I think you are the breeder who had the biggest number of puppies in 2007, bravo. And they hunt, it's clear. I hope the French will do as well as you in 2008!